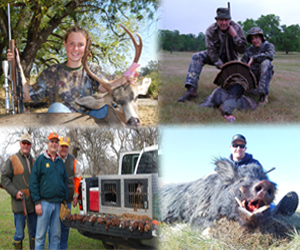 Guests can choose between blacktail deer hunts or wild hogs. Our property is perfect for both these animals and we’re sure you’ll find a nice trophy to take home! We now offer over 10,000 acres of prime habitat for Trophy blacktail. We have a healthy buck to doe ratio resident herd that we manage very closely through habitat work and the number of animals taken per year. On your hunt you will see an abundance of wildlife and average 6 to 10 bucks a day. Your all inclusive 3 day hunt will include Guide, lodging, meals and field dressing ready for butcher. We do have walk-in cold storage and can provide preparations for your trophy for the taxidermist and can assist with our local taxidermy. Wild hogs — actually a combination of feral hogs and Russian boar — have flourished in this country since the coming of the early settlers. They are fast-becoming California’s No. 1 big game animal and tracking these potentially dangerous critters is a real rush. Wild hogs are extremely challenging to hunt because they possess a keen sense of smell and hearing in combination with speed and brute force. At Red Bank hunters get an opportunity at a clean shot, at good range, or they only pay the guide fee. That’s how confident we are that our population of free-ranging wild hogs is strong and sustainable.